Our house is filled with the scents of the holidays – chestnut & clove, vanilla cedarwood & fresh eucalyptus. Soon we will be putting out evergreen branches & mistletoe, prepping for turkey day & starting all our holiday shopping soon after. Every day just gets more exciting as the winter holidays approach. This Thanksgiving and Christmas will be the most memorable of our life thus far, since we’ll be celebrating with a little babe in tow. 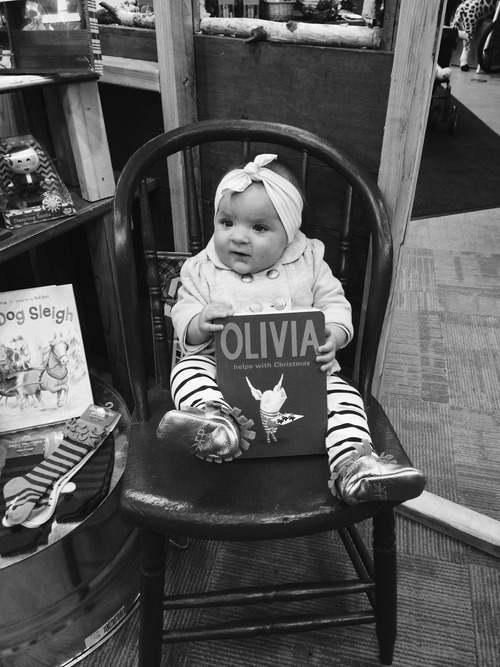 I’ve already started working on all the special gifts we’ll be giving to Olivia this year, planning my 25 Days of Christmas book list for Via, purchasing the perfect advent calendar, finding stocking stuffers for my hubby & shopping for all my holiday outfits. Last weekend, while Dustin was out of town, my mom and I had a fun weekend together. I had the whole weekend off work and we spent our time together doing some of our favorite things – we spent Friday evening strolling along Grand Avenue, shopping, a light dinner at Café Latte (+ our favorite slice of cheesecake with berry preserves of course), and finding some special things for the holidays. We bought Olivia her very 1st ornament – a duckie ugling. If you haven’t seen them or heard of them before, they are adorable little ducks handmade in St. Paul from recycled sweaters. It’s always fun to start new traditions – esp. with a little babe – and I decided every year it would be tradition to buy her a new duckie ugling ornament for the tree. It will be a fun way to look back on each year of her life. 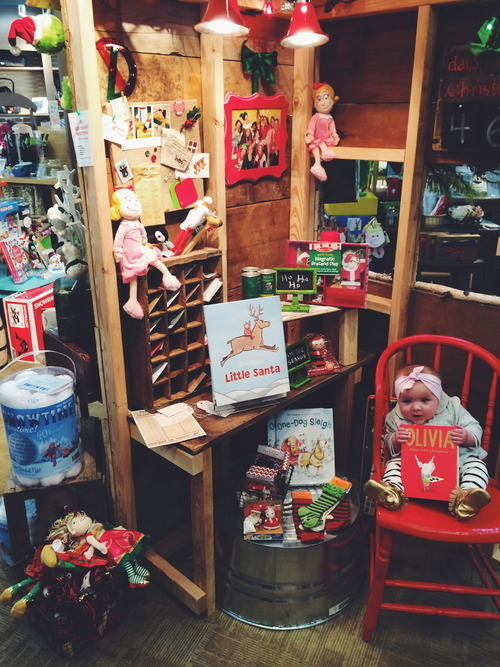 To end the night, we had to stop at Creative Kidstuff and we spotted the perfect photo op for Miss Via. 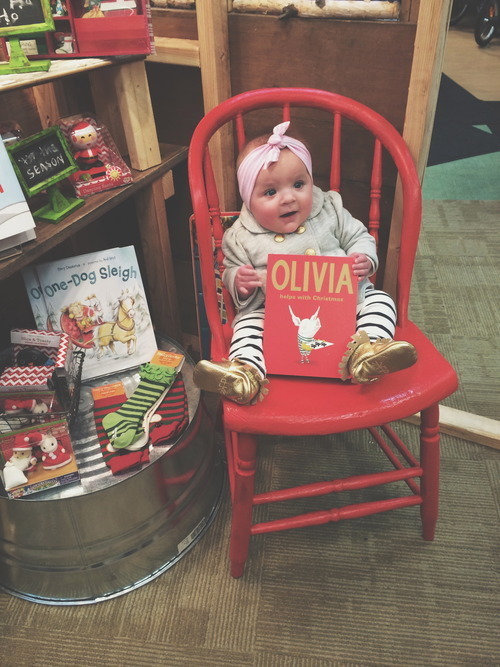 They even had the book “Olivia Helps with Christmas” for her to pose with! I title this one the ”I can’t believe I have to wait 46 more days until Christmas” photo. On Saturday I enjoyed sleeping in and running some errands. Sometimes the days with no real agenda are the best days. Then dinner with a wonderful friend of mine at our favorite spot. Afterward, some shopping with Mom & lounging at home. On Sunday we went to the MOA for a book signing by one of my favorite celebrities. I don’t follow many celebrities or their lives because that’s just never been my personality, but one person I have always admired and loved watching is Giada de Laurentiis – award winning Food Network author and television host. 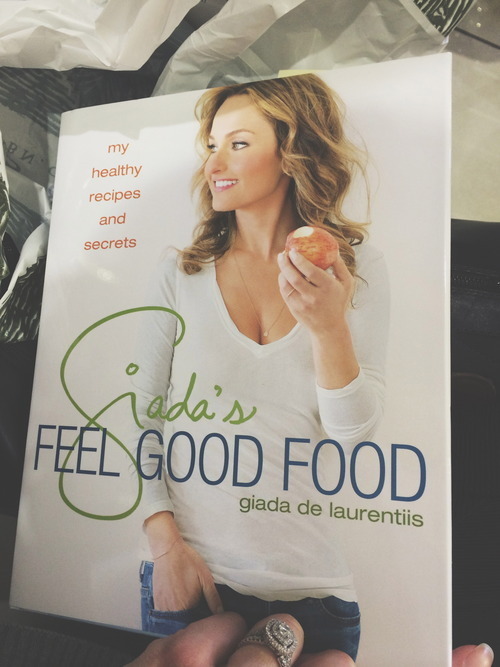 We purchased her newest cookbook, “Giada’s Feel Good Food,” which includes 120 of her healthiest and lightest recipes plus all her tips and tricks to staying so fit. I had the book dedicated to Olivia and even Via got to meet Giada when we went up on stage. I can’t wait to start raising Via on healthy, wholesome cooking and will one day give the cookbook to her as a gift. Bonus – as we were walking off stage, Giada got up and posed with us for a photo! God’s favor for sure, because no one else was given this opportunity. On top of all that, I found a beautiful black dress (Old Navy…35% off!) that will be PERFECT with all kinds of fun tights and boots for the holidays. Now I’m on the hunt for the perfect accessories for it. After the MOA we ventured to IKEA…a place I could easily spend hours in. 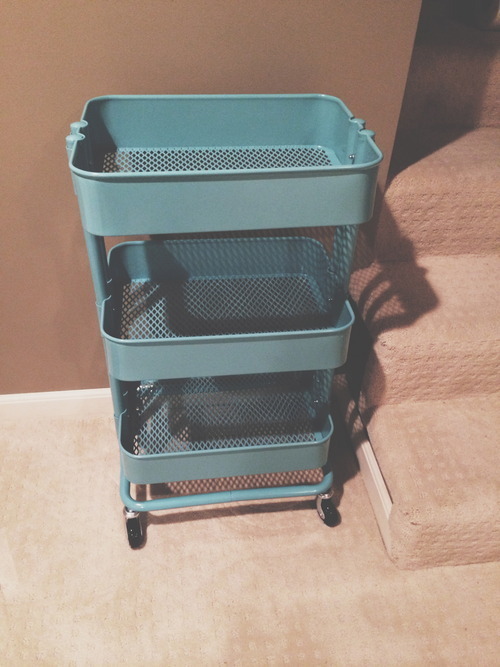 We spotted a beautiful turquoise cart that I knew would be perfect for our basement in Via’s play corner. Dustin and I put it together on Sunday night and I can’t wait to fill it with new books and toys for the holidays. We also purchased shelves for the nursery that I had been eyeing for ages. They are the perfect size & a super reasonable price. 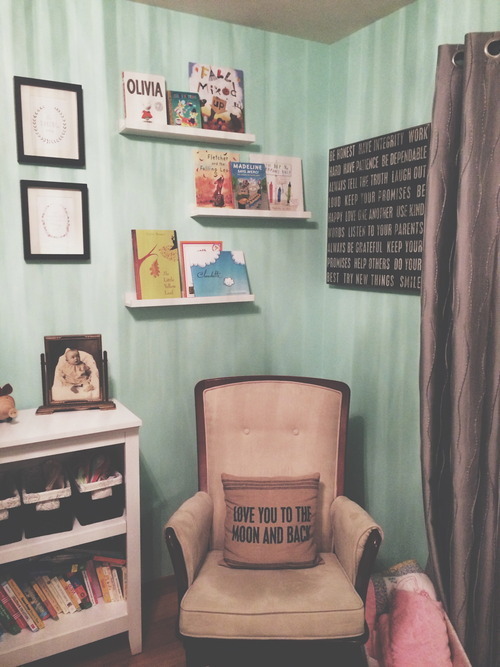 I finally feel like our gallery wall/nursery book nook is complete! (I’m sure we’ll be adding more of these shelves in other rooms of our house before too long). It was a blessing to have Dustin home on Sunday night and hear all about his weekend away with my Dad and all the other guys from our church on the Men’s Advance. This year’s theme was “MAN UP!” and their weekend was filled with great teachings, lots of food, some football, and plenty of stories. Monday was back to a more normal routine – a dentist visit, grocery shopping, baking a chocolate cake and entertaining good family friends in the evening. Tuesday morning I went to my girls of grace group at church and then a few more errands. House-cleaning & laundry. The usual stuff. I surprisingly love doing laundry – especially folding it all & putting it away. It is so rewarding to see an empty hamper in the bathroom closet and all my clean clothes for the week ready to be worn. 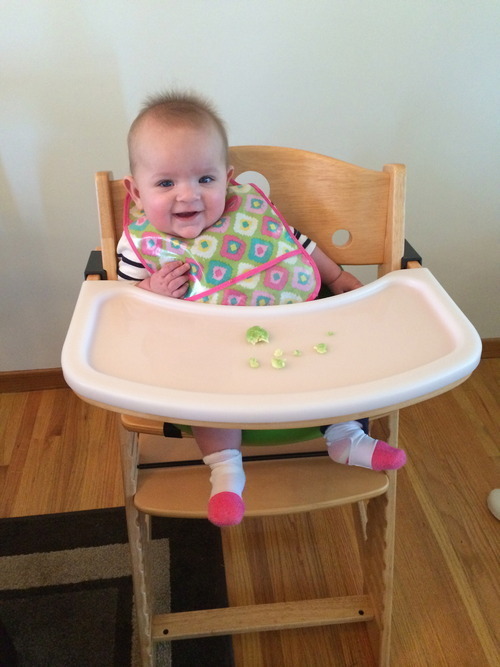 On Tuesday afternoon I introduced Olivia to solid foods for the first time. 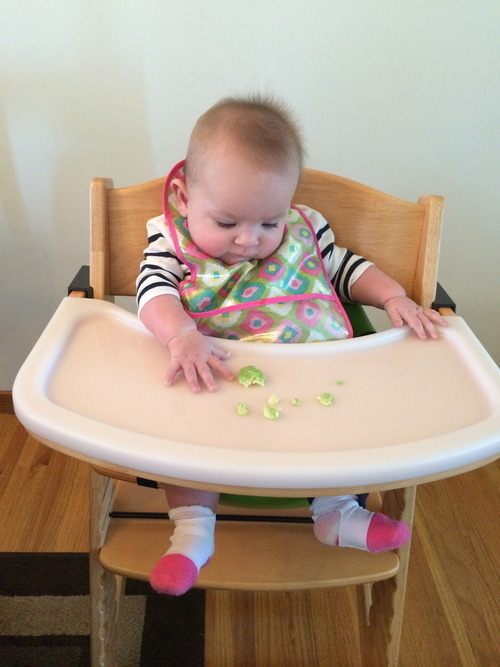 We are approaching food with the “Baby Led Weaning” (also called “Baby Led Solids”) method. If you’re interested in finding more out, check out this book. Some of the best and healthiest foods that we are starting Via with over the next weeks and months are avocados, sweet potatoes, steamed squash, steamed cauliflower and cooked egg yolks (NO egg whites). I started with sliced avocado and while Via didn’t seem to be in love with it, I think it will grow on her. 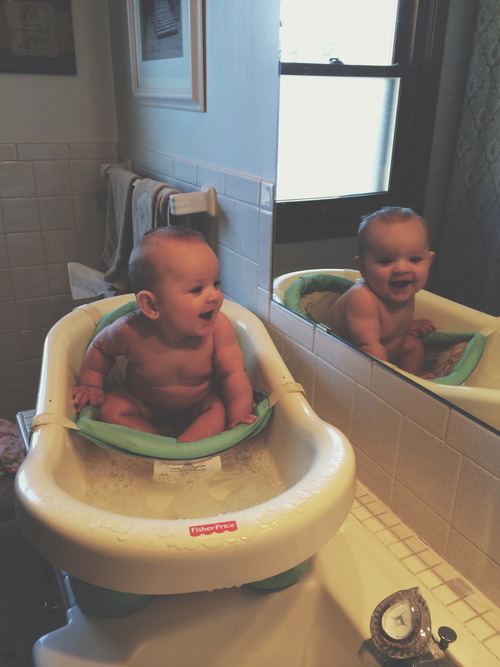 XOXO from our squeaky clean little bean.